Gardens of Equestria Panel at BronyCon 2017! Alright everyone, there’s some great news for anyone that’s going to be going to BronyCon 2017! Hey everyone! Mercury here just letting you know that we were super excited to have seen everyone who attended our recent panel at EFNW 2017! For anyone who missed it, our panel was on the 13th of May. The wonderful crew at EFNW have provided us with a video of the panel so that no one gets left out from the excitement! GoE Chapter 1 Teaser Trailer Released! Gardens of Equestria Panel at Everfree Northwest! Alright everyone, a fun annoucement for anyone that’s going to be going to Everfree Northwest! Download it now at NexusMods! 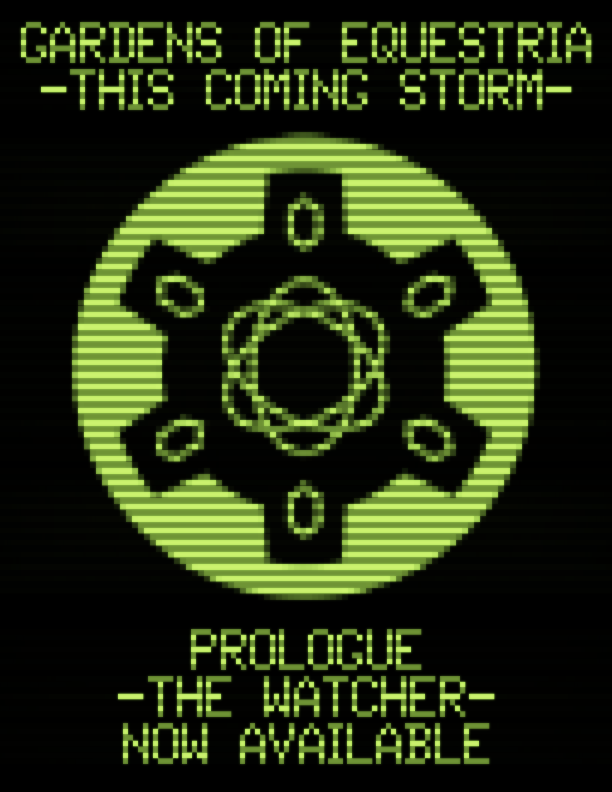 The Watcher is the prologue for Gardens of Equestria: This Coming Storm, and the first in a series of episodes in a DLC-length mod for Fallout: New Vegas. 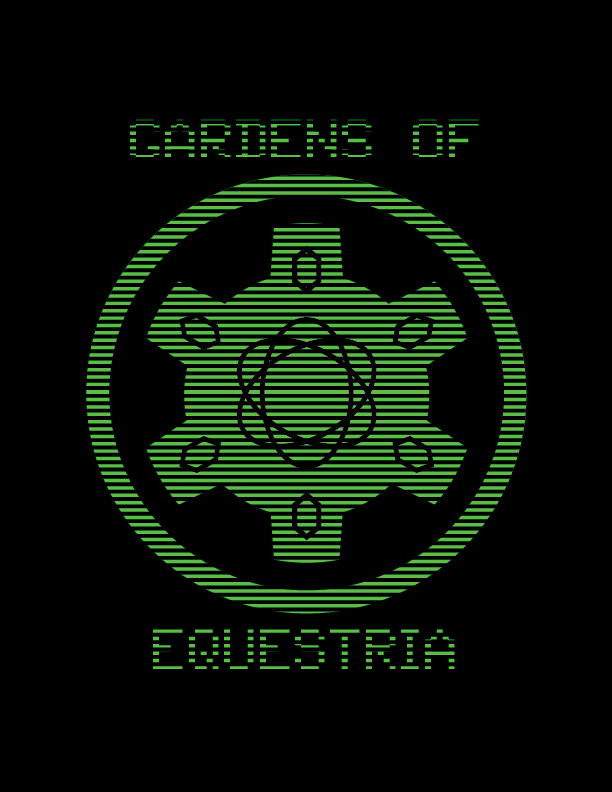 It introduces players to Gardens of Equestria, an episodic adventure that shuffles the reality of New Vegas like a pack of cards. GoE introduces new enemies, allies, and unique equipment from beyond the Mojave. As you investigate the cause of these echoes, you will choose a side and decide the fate of two worlds. However, it’s not just the start of a world-spanning adventure. Changes have swept through the New Pegasus area, altering everything from billboards to ancient Pre-War posters, stimpaks to road signs, teddy bears to the Las Pegasus sign itself. There’s also a new PipBuck radio station featuring 32 of the greatest hits from the MLP:FiM fandom. The reality distortions have even affected your PipBuck’s user interface, complete with new loading screens, a new progress wheel and altered game Perks. Custom cinematics, a fully-voiced cast, unique new ambient music and much, much more await you within. Gardens of Equestria: This Coming Storm requires Fallout: New Vegas and the Old World Blues DLC. Prices and participation may vary. See store for details. If your download lasts for more than six hours, contact the Ministry of Peace immediately. This simulation has been approved by the Ministry of Morale, and verified by the Ministry of Arcane Sciences to run on most StableTec(TM) terminals. Get Hype. GoE Goes Live at Noon on February 17! Novel Idea here with a very special announcement. The moment you’ve been waiting for. Over a year and a half in the making. GARDENS OF EQUESTRIA: THIS COMING STORM GOES LIVE FRIDAY, FEBRUARY 17 AT NOON PACIFIC! It’s finally here. You finally get to experience the prologue of an epic adventure that will span space and time, introduce new factions, new companions, new allies and new enemies. You’ll journey into a hole in reality itself as you uncover the greatest secret hidden in the depths of the Mojave. The fate of two worlds hangs in the balance. Are you ready? Because you’d better get ready. Smuggler’s Run was just the beginning. It was the commercial for the brand-new TV series. Well, now you get to experience the pre-credits segment of the series! The changes have already swept through New Pegasus. Billboards now show ads for the Ministry of Peace, the Ministry of Morale and the Ministry of Arcane Sciences. Every road sign within fifty miles has mysteriously changed to New Pegasus. From stimpaks to the actual New Pegasus sign, the world will never be the same. But that’s not all of it. A brand-new 32-song radio station is now available, featuring some of the greatest hits in all of the MLP:FiM fandom, including Aviators, MandoPony and so much more. 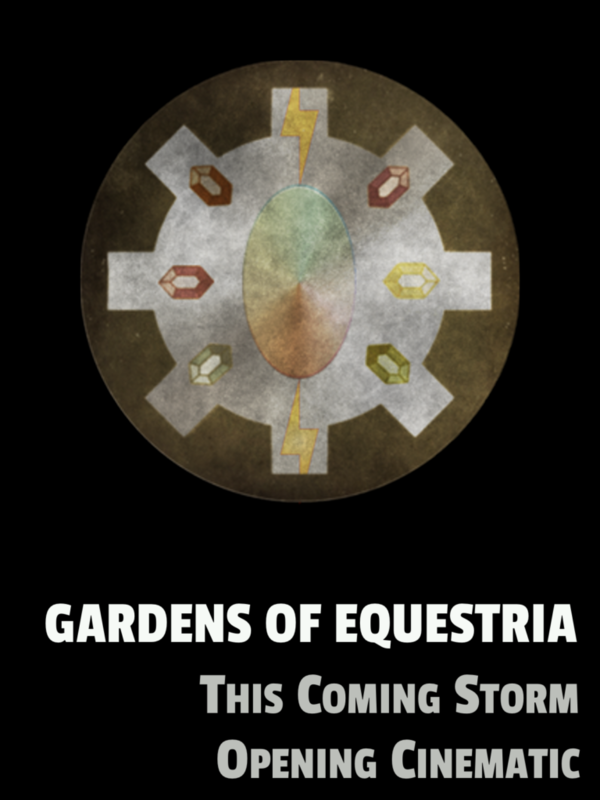 Our Prologue, “The Watcher,” will introduce you to the story of Gardens of Equestria: This Coming Storm. A strange message sends the Courier to Goodsprings to meet with a girl who claims a mysterious cave has appeared overnight in the cliffs above town. This seemingly innocent event reveals a secret that shakes the very foundations of reality itself. You’ve watched the trailers. You’ve read the blogs. You’ve seen the screenshots. Now, experience it for yourself. Novel Idea here with something you have all been waiting for. I know I have. Now, I could tease and play with the information and drive you all crazy, but instead, I’ll just tell you what’s going on. For those of you who attended Pacific PonyCon, you already got most of this information. For everypony else… it’s time for the good stuff. We’ve got three major announcements today. We are currently aiming to release “Prologue: The Watcher” at the beginning of February 2017. Today, you get to see the Opening Cinematic of Gardens of Equestria: This Coming Storm. This is the actual cinematic you’ll be seeing in-game when you play the Prologue. So, let’s talk about what this all means, shall we? Why episodic content? Well, the truth is, the scope of Gardens of Equestria: This Coming Storm is massive. An original worldspace, over ninety levels, four unique voiced characters, dozens of new weapons and armor and so very much more. In addition, we’re a purely volunteer project. That means wives, husbands, kids, full-time jobs, college and a thousand other things. What that means is that because of real life, we likely wouldn’t release anything for at least two years if we went for a full production model (and that’s on the extremely optimistic side. In truth, it would probably be longer). I don’t want to wait that long and I know you don’t either. Going episodic means you’ll actually get the content in a better timeframe. Yes, there will be delays and you won’t be able to play the whole thing in one go (unless you wait until the very end), but the important thing is you’ll be able to see what we have coming! What this means tech-wise is that you’ll just be replacing the GoE files with the new ones! That’s right folks! While our guests at Pacific PonyCon 2017 got to see a live playthrough of the “The Watcher,” soon you’ll be able to adventure there yourself! Get a mysterious message from DJ-PON3 and investigate the strange events in the cliffs north of Goodsprings. Not only that, but you’ll get the first phase of the reality distortions! New billboards, new artwork, new music, a new radio station and so much more. Now, the thing to remember is that reality itself is changing! Things will get progressively worse until you put a stop to the chaos! So there’s even more to come! Watch for the release of Gardens of Equestria: This Coming Storm – Prologue: The Watcher in February of 2017! This cinematic will play in-game once you reach the correct moment of the Prologue, like the opening of Fallout 3, Fallout: New Vegas or Fallout: New Vegas’s DLCs! In the coming months, we’ll have more information as to the release schedule of Chapter 1: Strangers in a Strange Land and Chapter 2: Small Advantages. First of all, a special thanks to the staff of Pacific PonyCon for having us and hosting the very first GoE panel. It was an amazing experience for all involved. Sadly, we had a miscommunication on the Manehattan side of the team and weren’t able to record video of the panel. In addition, the audio we recorded didn’t turn out very well (though our audio team did an awesome job salvaging most of it!). That’s okay, because in the next few months, we’ll be releasing interviews with the entire Board of Directors of The Manehattan Project! 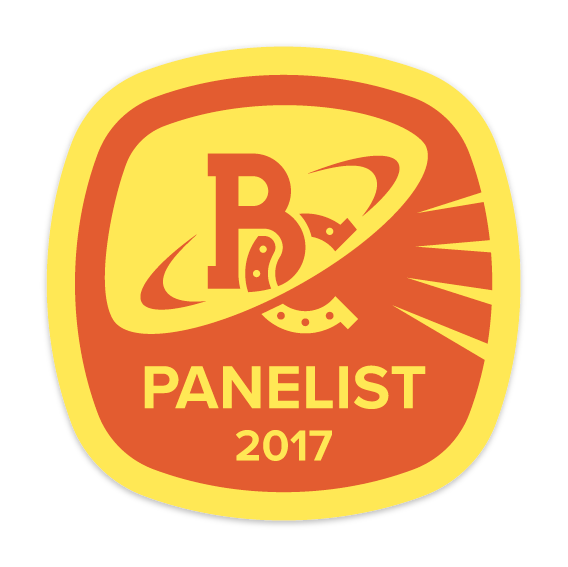 We’re currently looking into doing panels for more conventions! That’s right, so if you missed us at Pacific PonyCon, you might get a chance to see us in person at another major MLP convention! Once we have confirmed venues, we’ll release more information, but we’re currently aiming for at least two more conventions with a possible third! Interested in Doing Art or Modeling for Manehattan? Finally, we’re doing an open call for any artists or 3D modelers who might be interested in joining our staff. We’ve got a lot of art assets slated for this game and we’re looking for new talent to help us bring Gardens of Equestria to life. If you’re interested in helping us out in art, modeling, scripting or think you can contribute to the project in another way, head over to our recruitment center and send in an application! Remember, if you’re interested in a career in game design or a similar field, this is the perfect sort of project to have on your resume! And that’s it for this week folks. 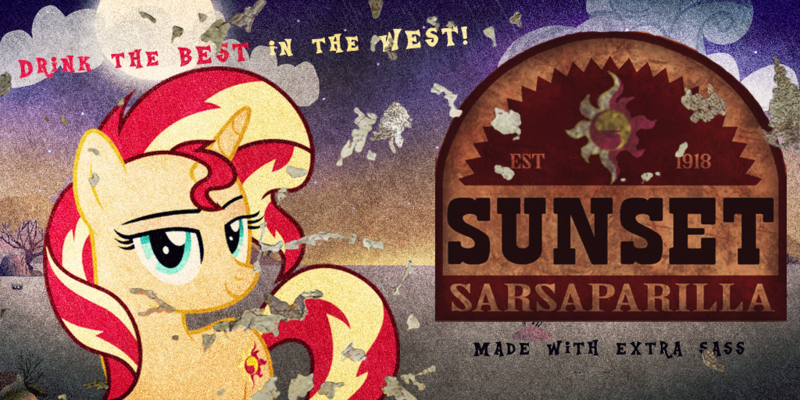 We’ll have more for you in the coming weeks, but today I’m going to leave you with a look of the brand-new Sunset Sarsaparilla Billboard you’ll be seeing in This Coming Storm. This was designed by yours truly on Tuesday night! Big Announcement at Pacific PonyCon & New Website! Tomorrow's the big day. Tomorrow, The Manehattan Project will do a live world premiere of the Prologue on Gardens of Equestria: This Coming Storm at Pacific PonyCon 2017 at 7:15 PM in the Guest Panel Room (Harborside Room). We've been working around the clock (literally, since Little Tinker is in Australia, which is like +18 hours ahead of us) to get this ready for you. And we've done it. We've got one hell of a demonstration set up. You'll be seeing our opening cinematic. Built from the ground up for this game, this cinematic will finally reveal the grand adventure the players are about to embark on. We've also had a few changes in our line-up for tomorrow. Sadly, Silver Chord won't be able to join us tomorrow (everything's fine, just real life got in the way). However, you'll still have Polyphonic, former Vocal Director and Voice Actress for Velvet Remedy, Candi and more, Ebon Quill, Quest Designer and our new Vocal Director, and of course, myself, Novel Idea, the Project Lead. We'll be talking to you about how this all began, how voice acting really works in the gaming industry and an in-depth look at the story-building required for something as massive as GoE. Finally, we have one enormous announcement that's exclusive to all attendees of our panel tomorrow. Yes, everyone else will find out next week. You won't want to miss this. This is one thing you probably didn't see coming. You've probably noticed that things look quite a bit different around here! We've got a whole new setup, now featuring some of the coolest parts of GoE right here in once place. So, take a look around! We've got features on the bottom, a new logo up top (I'm still fiddling with that bit) and all sorts of other goodies. In addition, I've also done a massive redux of many of the website pages throughout the site. There's still a bit of optimization to do, but I think you'll find exploring things much easier. Just a tip... check out the locations page! For those who enjoy my stories, I'll also be attending all three days of the convention, so feel free to say hi and stop by the panel to see what this is all about! In the last couple of months, I've released several new stories. You can find them all at Novel's Nook, but here are some direct links for you at the bottom as well. We'll see you next time! Twilight’s got her nose stuck in a book. Sunset wants to go see the rest of their friends. As winter descends upon Canterlot, Sunset gets an idea. Things snowball from there. After an entertaining evening meeting Sunset’s newest friend Twilight Sparkle, Princess Celestia seeks an old intelligence report that may hold a devastating secret from Equestria’s past that will forever change Equestria’s future. Gardens of Equestria Live at Pacific PonyCon 2017! That’s right folks! Today we’ve got an extra-special update. The Manehattan Project will be hosting our first-ever convention panel at Pacific PonyCon 2017 on the weekend of January 6-8, 2017 in San Diego, California! At the GoE Panel, you’ll get a world-exclusive first look at the Prologue of Gardens of Equestria: This Coming Storm including our brand-new cover artwork by Blue Nova, featuring music by Corvus Productions and custom voicework! During the panel, you’ll actually get a chance to speak with four members of The Manehattan Project itself! Ebon Quill – Quest Designer & Worldbuilding Writer! Silver Chord – Worldbuilding Writer & FimFiction Author! Polyphonic – Former Vocal Director and the Voice Actress for Velvet Remedy, Candi and more! Novel Idea – Project Lead & Creative Director as well as author of the Wavelengths Timeline series. Not only will you get a live demo of the Prologue including the epic opening slideshow for Gardens of Equestria: This Coming Storm, but you’ll also get to hear about the challenges of writing for a game project of such an enormous scope, the design challenges of managing a team that spans half the planet as well as the immense task of organizing a team of over twenty voice actors while performing a variety of voice acting roles! In addition, our panel will be moderated by the one and only LiamNeighson, author and veteran of countless pony conventions across the United States as a moderator, volunteer and general pony enthusiast! There’s still plenty of time to register as well! Head on over to Pacific PonyCon’s website today and get registered to experience this first-ever reveal! Plus, you’ll get to see MLP legends as Nicole Oliver (Celestia & Cheerilee), Tabitha St. Germain (Rarity & Luna), Kelly Sheridan (Starlight Glimmer), comic artists Sarah Richards, Tony Fleecs and illustrator Mary Bellamy, plus amazing cosplayers and more community guests! We look forward to seeing you in January in San Diego!